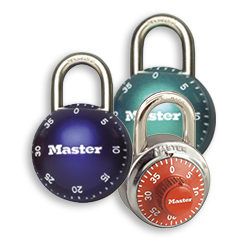 Master Lock offers a variety of special services to customize your locker locks to best suit your organizations needs including colors, laser engraving, keying options & more. Personalize your Master Lock Combination Locker Locks with color to complement your school or organization – available on the SmoothSpin™ Series, 1500 Series and the 1600 Series Built-In Combination locks (metal dials only). Choose from a variety of colors available including Green, Blue, Purple and more! 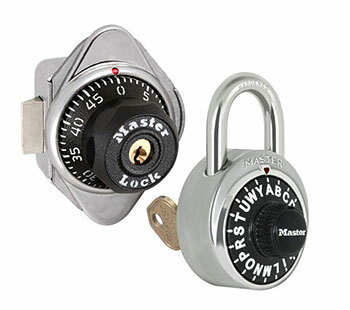 You can personalize the Master Lock Combination Locker Locks. 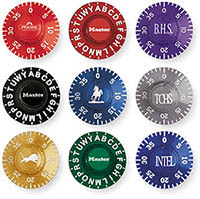 Choose laser engraving or pad printing to add your organization‘s name or logo to the dial knob for enhanced aesthetics. Pad printing paints the organization‘s logo or name on the dial surface. There is a one-time set up charge for the die which is then stored for future orders. 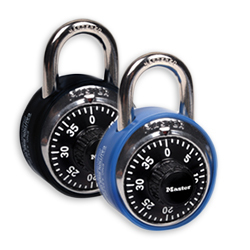 Add bumpers to your portable combination padlocks to reduce locker wear and noise. Available in black, red and blue. Specialized back case printing is available to add your custom text, engraved, in the back of your portable combination padlock. Master Lock Portable Combination padlocks are available with multiple different shackle size options to be sure to fit your application. Master Lock provides information regarding product installation, changing combinations for built-in locks, replacement parts and product terminology. Master Lock maintains an extensive database on each installation to maintain high security and to make it easy to add locks to your system. Security management is crucial to an installation. Extensive user registration eliminates duplicate serial numbers within an installation and avoids key system crossover by zip code. Replacement charts and control keys can only be ordered for users of registered systems. This is imperative to a secure system. 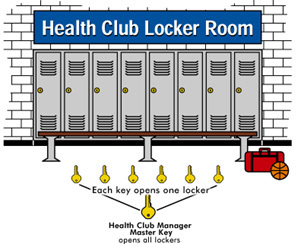 For your convenience and security, Master Lock provides easy-to-use Control Charts to help you keep track of locker assignments and the corresponding combinations. 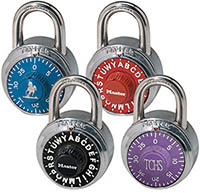 Charts are supplied with all combination padlocks and Built-In combination locker lock applications. You can request your Control Chart electronic file with this form. Your CD will include a text file of your records. Master Lock extension kits allow you to install your Master Lock Built-In Locker Lock on most locker types. 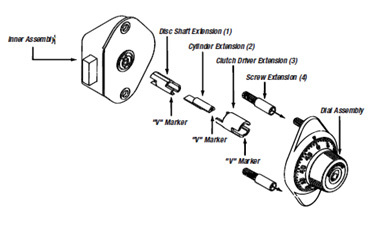 Extension kit enables standard Master Lock Nos. 1630, 1652, 1654, 1655, 1670, 1671 and 1690 combination locks to operate in 11/16in (17mm) to 3/4in (19mm) thick standard locker doors. Extension kit enables Master Lock Nos. 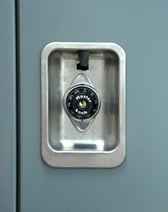 3630, 3631 and 3670 multi-user locks to operate in 11/16in (17mm) to 3/4in (19mm) thick standard locker doors. 3. Dial – smooth-turning dial affords quick access. Five pre-programmed combinations available at the press of a button on all Built-In combination locks. 4. Key Control Option – key control override feature allows quick access by supervisor or administrator. Available with both combination and Built-In locker locks. 5. Shackle – choose from hardened steel (1502, 1525) or hardened steel alloy (2002, 2010) for maximum resistance to cutting and sawing. 6. Case – Stainless steel outer case with cold-rolled steel inner case protects locking mechanism from severe physical attack. 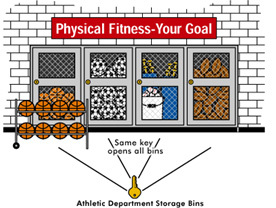 When facing the locker, if the hinges are on the right side, it is considered a right-hand opening locker. Conversely, if the hinge is on the left, it is a left-hand opening locker. 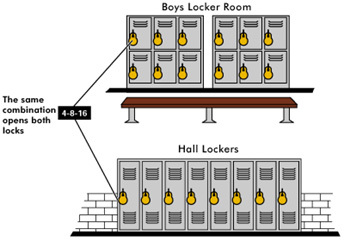 Many locks are specified for either right-hand or left-hand opening lockers, so be sure to select the correct lock when ordering. Key Controlled – locks which have a key override for supervisory access. 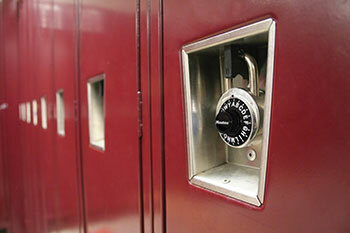 Built-In – Locks which are bolted to a locker door. 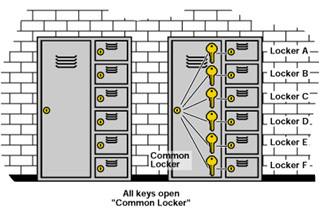 Built-In Key Lock – Locks opened with a key, which are bolted to a locker door. No combination. Pin Tumbler Lock (1710/1714) – Locks that have a pinned keyway for higher security. Dead Locking Latch on Bolt (1670) – Bolt which requires that the dial must be turned to engage the lock. Springbolt (1652/1654) – Spring loaded bolt which allows the lock to be locked without turning dial. Bolt Throw – Outward movement of bolt. Knob and Dial Assembly on Built-Ins – See supplemental parts sheet. Lift Latch (1630) – Vertical travel locking bolt engages lift handle locker mechanism. Wrap-Around Latch – Convenient, automatic slam-shut locking combined with automatic and secure dead bolt locking.